More than 300 applicants from 55 countries all over the world (Afghanistan, Argentina, Brazil, China, Colombia, Egypt, India, Italy, Mexico, Nigeria, Pakistan, Spain, Switzerland, Turkey, Venezuela, etc.) 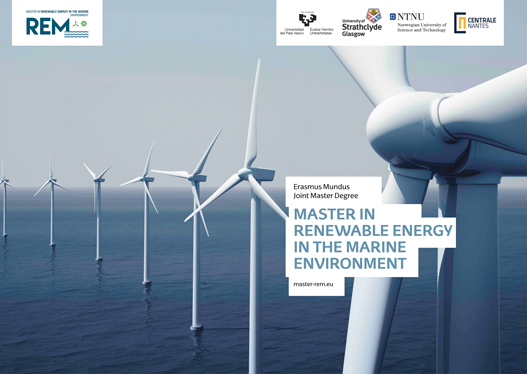 for the first edition of the Erasmus Mundus REM Master’s Degree in Renewable Energy in the Marine environment (REM). On the 28th March, the Joint Programme Board (JPB) meeting took place at the School of Engineering of Bilbao. This has been the first face-to-face meeting that the coordination body of the master maintained since the concession of the Mundus label was notified. In addition to the selection procedure of students for the first intake, it will formally constitute the coordinating body of the Master (JPB). 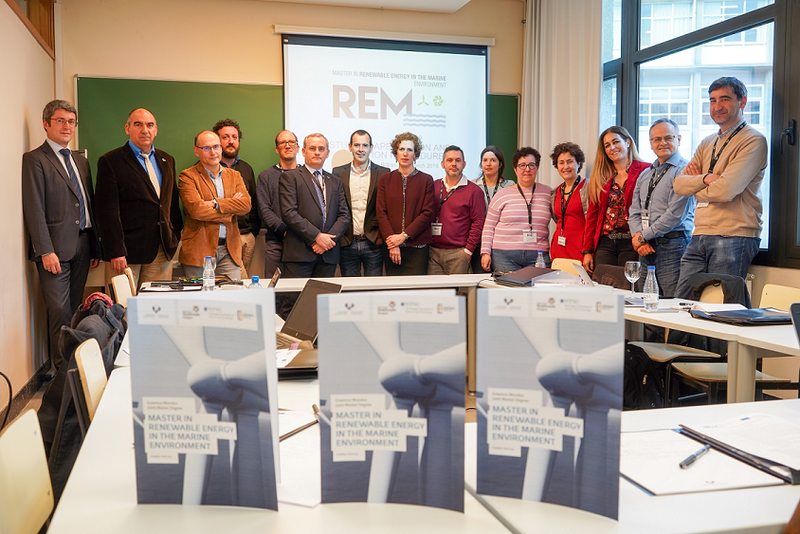 It is made up of one member from each partner universities and the director of the Master, Jesús María Blanco from the Department of Nuclear Engineering and Fluid Mechanics, School of Engineering of Bilbao, UPV / EHU. Other attendees at the meeting are a secretary, an international representative and a visiting validator who will record the meeting to the European Union. The whole group can be seen in Figure 1. Fig. 1. Attendees to the JPB Meeting. 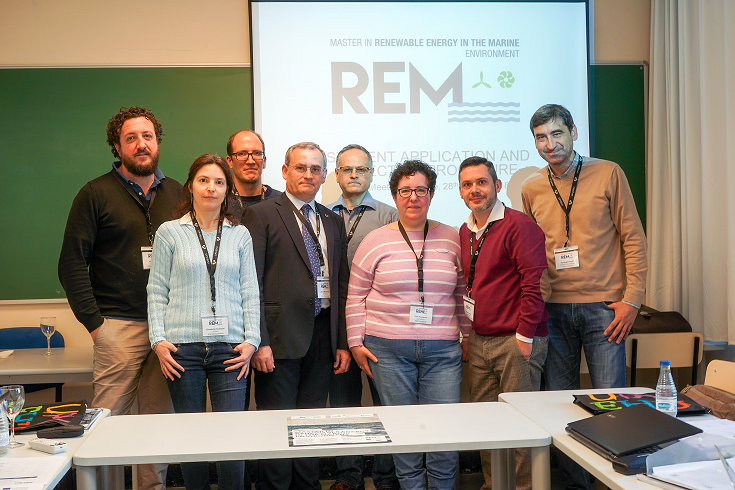 From left to right: Pablo Eguía (JPB representative, UPV/EHU), Elisabetta Tedeschi (JPB representative, NTNU), Guillaume Ducrozet (JPB representative, ECN), Jesús M. Blanco (REM coordinator, UPV/EHU), Olimpo Anaya-Lara (JPB representative, UoS), Pilar Rodriguez (REM Secretariat, UPV/EHU), Alberto Carrera (External relations officer, UPV/EHU), Santiago Reyes (Visiting Validator, ONECO Consulting). Excused: Iñigo Martínez (UAB representative, UPV/EHU). Foto: Mitxi. UPV/EHU. The selection is only regarding excellency. Therefore, candidates are evaluated and selected according to academic merit. On April 15th the list of the 12 candidates finally selected to be granted with a full scholarship (covering all expenses, including fees, travels and accommodation in the countries in which this postgraduate degree will be lectured) from September 2018, will be submitted to the Education, Audiovisual and Culture Executive Agency (EACEA). Another 12 candidates will also be selected on a self-funded basis. Some authorities from UPV/EHU and Basque Government respectively, were also welcome during this meeting in order to express their support to the proposal and exchange some views with the attendees. A photo was also taken with all of them, as can be seen in Figure 2. Fig. 2. Visit of some authorities to the JPB Meeting. From left to right: Jordi Campás (Director of economy, Basque Government), Jose Ignacio Armentia (Director of the Master and Doctorate School, UPV/EHU), Igor Campillo (Director of Euskampus Fundazioa), Pablo Eguía (JPB representative, UPV/EHU), Guillaume Ducrozet (JPB representative, ECN), Jesús M. Blanco (REM coordinator, UPV/EHU), Josu Sangróniz (Director of postgraduate studies, UPV/EHU), Amaia Esquisabel (Director of Universities and Research ,Basque Government), Alberto Carrera (External relations officer, UPV/EHU), Elisabetta Tedeschi (JPB representative, NTNU), Pilar Rodriguez (REM Secretariat, UPV/EHU), Margarita Herranz (Director of the Dept. of nuclear engineering and fluid mechanics, UPV/EHU), Itxaso Etxebarría (Project manager, Euskampus Fundazioa), Olimpo Anaya-Lara (UoS), Santiago Reyes (Visiting Validator, ONECO Consulting). Excused: Iñigo Martínez (UAB representative, UPV/EHU). Foto: Mitxi. UPV/EHU. 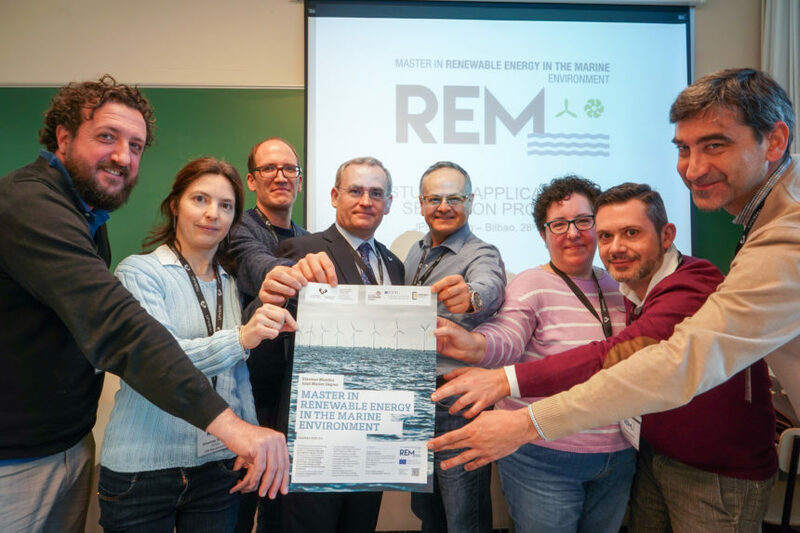 Wave & Tidal Energy Network magazine article on the Wave Energy Basque Country brandThese Boston colleges offering a reasonable schooling alongside prospects to provide their land can be very quickly located by undergraduate students.